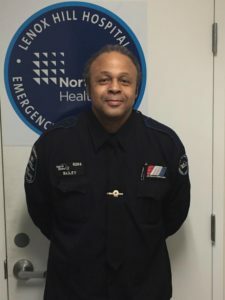 William “Bill” Bailey began his career in EMS in June of 1991 when he first received his EMT certification. It was during those initial clinical rotations that Bill knew he wanted to become a paramedic and do more to help those in need. Bill began working at Lenox Hill Hospital Northwell Health in Manhattan in 2000, and was one of the many first responders who answered the call on September 11, 2001. Bill is proud of his profession and believes that answering the call to help those in need is a truly noble endeavor. Bill is also a six year veteran of the United States Coast Guard. Bill was selected as a Star of Life nominee by his peers for his patience and kindness towards both his patients and co-workers. Thinking not only about his own career progression, Bill has served as an invaluable mentor to countless new medics.